A silk cap with patchwork designs of black, yellow, green and red triangles against a red ground. The triangles concentrate on the peak of the cap, which also has a silk tassel. 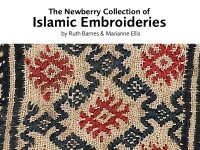 Embroidery designs are made from button stitch arranged in circles and triangles. The cap has a linen lining. The edge is carefully sewn with whipped silk stitching. 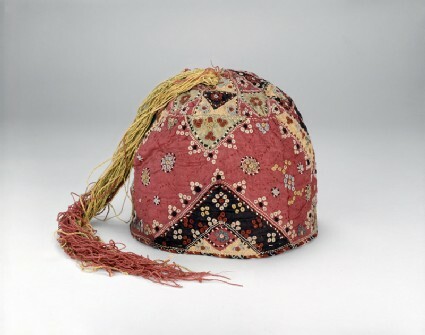 Caps from the Mamluk period (1260-1517) survive in considerable numbers, and the Newberry Collection at the Ashmolean Museum includes six, richly embroidered examples. This cap is the most vibrant of the group, and is constructed with colorful patchwork of silk strips outlined by minute clusters of eyelets embroidered in buttonhole stich. 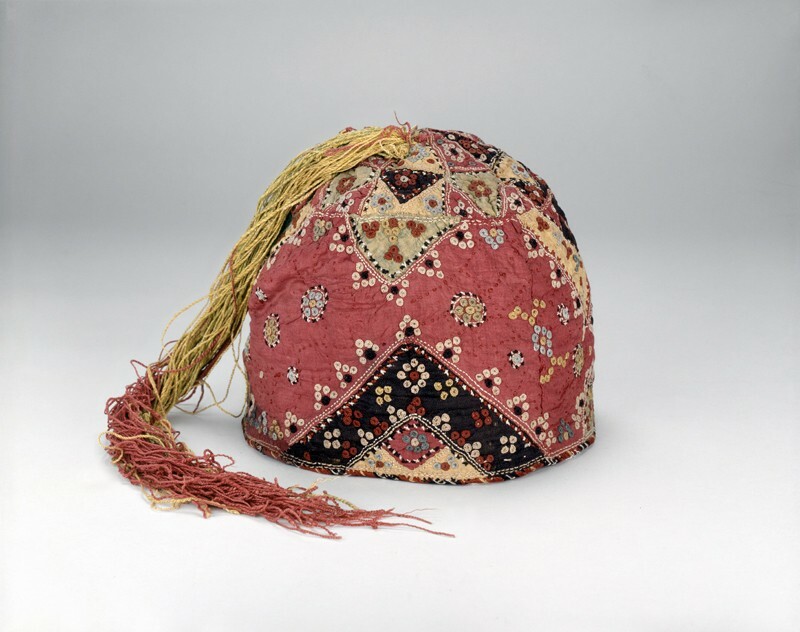 This little cap is an exceptionally pretty and colourful item with its long crimson and yellow heavy silk tassel, silk patchwork and fine stitching. It was constructed by securing silk fabric shapes onto a linen backing (applied patchwork) with two rows of minute black stitches. Diagonal lines of running stitch were used to stitch the layers of fabric together. Tiny eyelets embroidered in buttonhole stitch in contrasting colours form little clusters, triangles and hooked motifs.